As angry as I am/have been/probably will be again I can’t leave my last blog hanging out there for a week without making a point of the good stuff. There is much to encourage us about the race for the 6th in Georgia. I see things every day since that give me hope to power on. Women are on fire! It was amazing to work with and see so many energetic, committed women putting themselves out there every day and every evening for months. We have realized that politics cannot be a spectator sport. Voting is great, putting up a sign is important, giving matters – but it is not enough. And we worked our ‘osses’ off! We got woke. We became aware of voting issues and committed to work on the issues of racist voter suppression, gerrymandering, and election hacking. We got informed about the efficacy of paper ballots, ballot trails, and the need for election overhaul. Now we’re going to do something about it. We: long time activists like myself, and those who now join us, worked together, made connections, and saw it through. 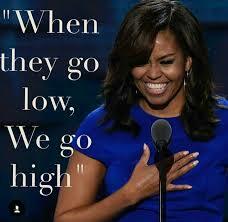 We took Michelle Obama’s words to heart: when they go low, we go high. We encouraged one another every day in face-to-face confrontation with the opposition ‘going very low’ to ‘go high’. We defined and continue to define ourselves by what we value . To paraphrase Hamilton: We are not a Moment, We are a Movement.